Best two drummers I've met are Danny Carey and pdf member DeepThought. Unlike Tim's experience with DC, he was nothing short of cool as hell when I met him. And DT is just good people and a badass drummer. That's awesome Thrush! I'm glad you got to meet a drum hero. I have to admit though, when I first looked at the picture I was like "You met a homeless dock worker... in an alley... OH WAIT IT'S MIKE!" Lol @ homeless dock worker! It’s almost like... famous people have bad days too! But I ignored them and went and met one of mine. 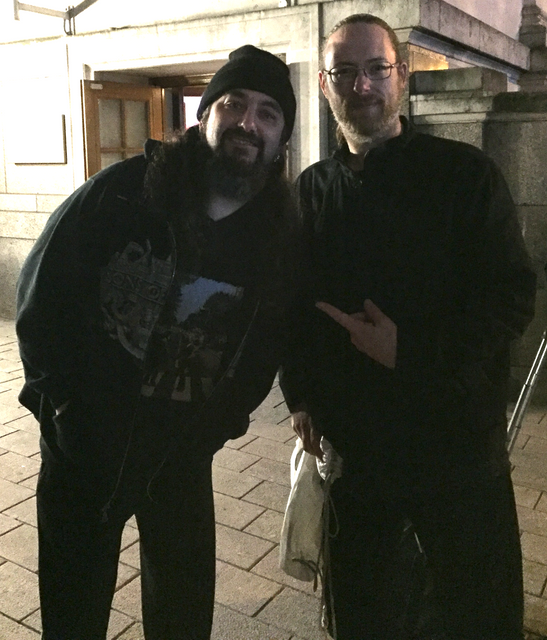 Mike Portnoy was in town playing with the Neal Morse Band, so since it wasn't far I nipped over, stood in the cold for a couple hours chatting to some other fans, and managed to grab a photo and a few words with him. He signed a drum head for me too. Really nice guy, pleased to finally meet him. That's right - Islington Assembly Halls. You'll have to let me know when you're in London playing, I'll try to come out and help out; I might not be a "pro tech" but I can lug cases from vans with the best of 'em! I met DC many many years ago at the Regatta Bar in Boston when he was playing with Mike Stern. He even let me take a little rip around his kit. Nice guy. Super mellow. I had no idea about that, but I saw him play with the Dead Daisies recently, and he was very good.